Angveirt Bug & Insect Catcher is a professional bug grabber tool to catch and release all types of critters, it helps to protect your home without leaving any mess, or using any harmful chemicals! Humane scorpion trap, spider and insect catcher provide a humane and safe way to clean bugs. No more spraying harmful chemicals in your home and no more swatting and cleaning bug spots off the wall. No electricity is needed, dislike those spider vacuum, insect bug vacuum catcher. 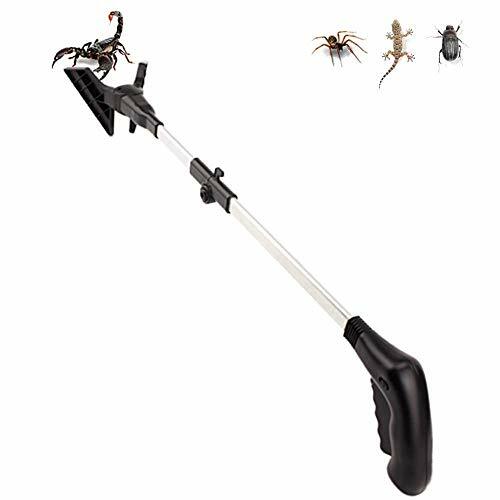 The humane bug catcher bug trap has a 28.7" long arm (16" after folding) for you to reach any creepy crawlies, it also can be used as a family essential pick-up tool for kitchen shelves, fishing or as a litter picker long arm reaching tool. A LED light is set near the clamp, turn it on/off through the switch on the handle. Thus help you to catch those creepy crawlers that like to hide in damp and dark areas. (Battery is NOT included). How to pick up insects? 1. Stretch the product by pressing the "press" button. 2. Squeeze and release the handle to make the clamp open and close, squeeze the handle again to release pests outside. 3. After using, fold the product by pressing the "press" button again. ★ A button cell sized CR2032 is used to supply led light, please note that this battery is not included in the package. Note: 1). This catcher doesn't work on hard shell bugs! if you want to catch them, please attach anti-slip tape on the inside of both clamps to increase the friction. 2). This trap may crush spider. Warranty: Our products are guaranteed for one year. Please feel free to contact us with your Amazon order ID if you need assistance. If you have any questions about this product by Angveirt, contact us by completing and submitting the form below. If you are looking for a specif part number, please include it with your message.